After a successful partnership in 2018, Elia and Proz.com will be joining to broadcast the fourth edition of Together – our annual two-day event with a mission to strengthen our industry by bringing language service companies and independent language professionals together in a positive, collaborative environment. The event provides an open dialogue on industry trends, covers mutually-relevant new approaches, updates on technical skills and, ultimately, develops lasting relationships to serve our end clients better. 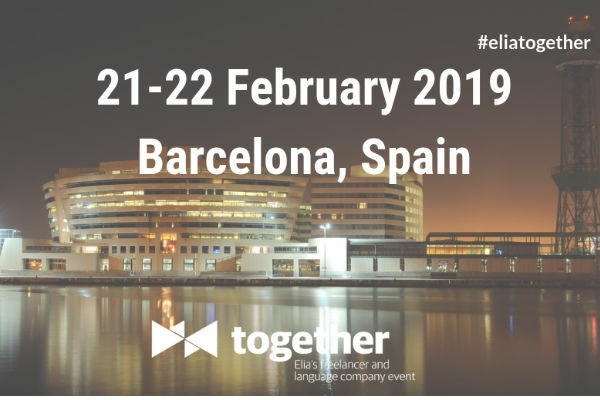 The theme for Together 2019 is “Mastering Digital Transformation” and the event will take place in Barcelona (Spain) on February 21-22. Through this partnership, Elia and ProZ.com will once again bring Together to a wider online audience, enabling more translation professionals to benefit from Elia’s best-in-class content.